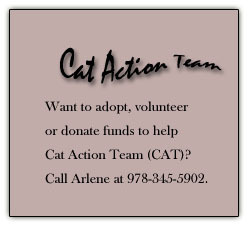 "The woman -- obviously mentally ill -- just moved out and abandoned them," said Arlene Cavanaugh of Cat Action Team. The odor permeating from the two-family home was noticeable from the street. 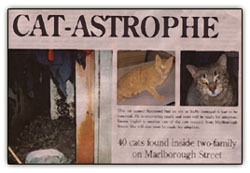 Come to think of it, we were walking in that neighborhood the other day and noticed a strong litter-box odor in the air. Inside, heaps of debris, trash and refuge lined the dark, cold hallways. In what should have been the kitchen pantry, four feet of cat feces was piled high. And around every corner and peering through the floorboards above were dozens of sets of eyes belonging to the near 40 cats that had been abandoned inside this decrepit home. Many of the cats will now be given a second chance at a happy life, but Cavanaugh is saddened by the fact that many didn’t even have a chance to live. Volunteers found dozens of cat fetuses around the house. “It was heartbreaking to see all the babies frozen to the floor,” she said. But new life was stirring in one of the cats that was staring down from the rafters, said CAT (Cat Action Team) lady Arlene Cavanaugh, who told us she had been quite overwhelmed with the awfulness of the site conditions and the number of cats she and her team had rounded up, using cages baited with fresh chicken meat. A moment of joy came when they rescued that cat from the rafters, who gave birth to three healthy kittens shortly after capture. As Melanie says in GWTW: "The happiest days are the days when the babies come."